doi:10.4236/jbise.2010.37090 Published Online July 2010 (http://www.SciRP.org/journal/jbise/). 4Department IV - Military Ergonomics and Exercise Physiology, German Armed Forces, Koblenz, Germany. 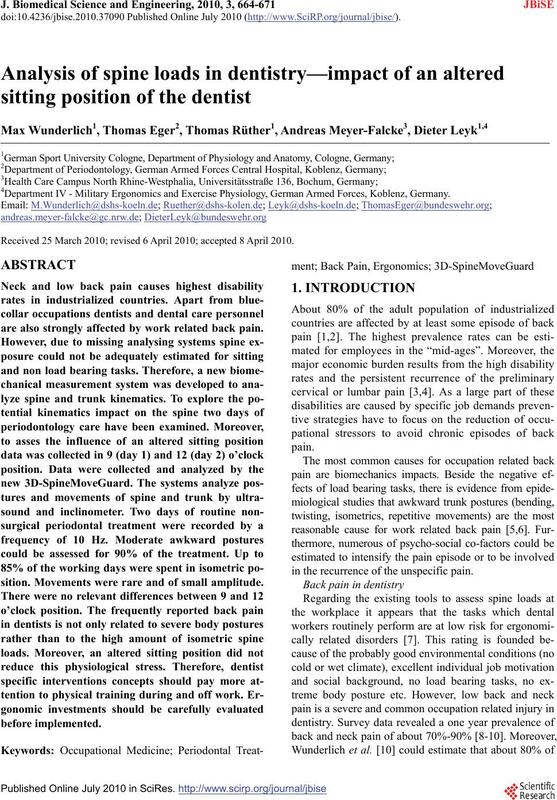 Received 25 March 2010; revised 6 April 2010; accepted 8 April 2010.
are also strongly affected by work related back pain. sition. Movements were rare and of small amplitude. in the recurrence of the unspecific pain. and to identify appropriate intervention strategies . 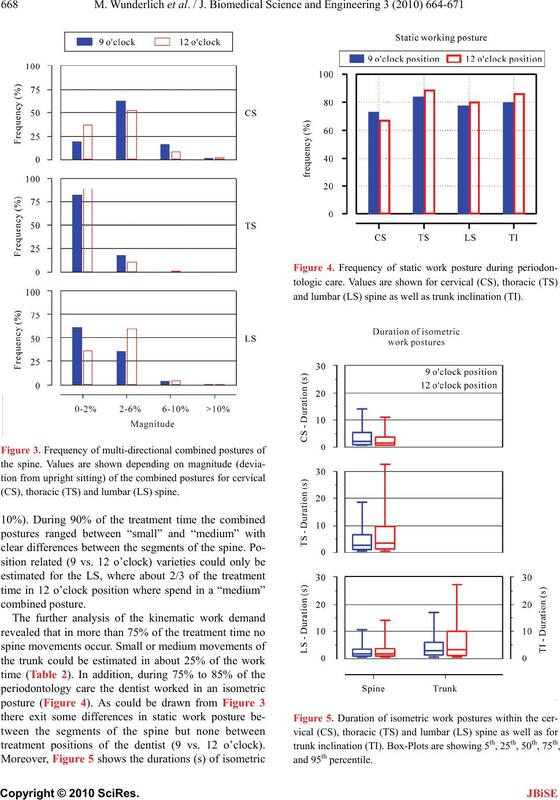 cated that a specific treatment position (“9 o’clock” vs.
the impact on the spine and the dentist’s health [8,12]. justify useful preventive or ergonomic interventions. study and gave their written informed consent. Figure 1. 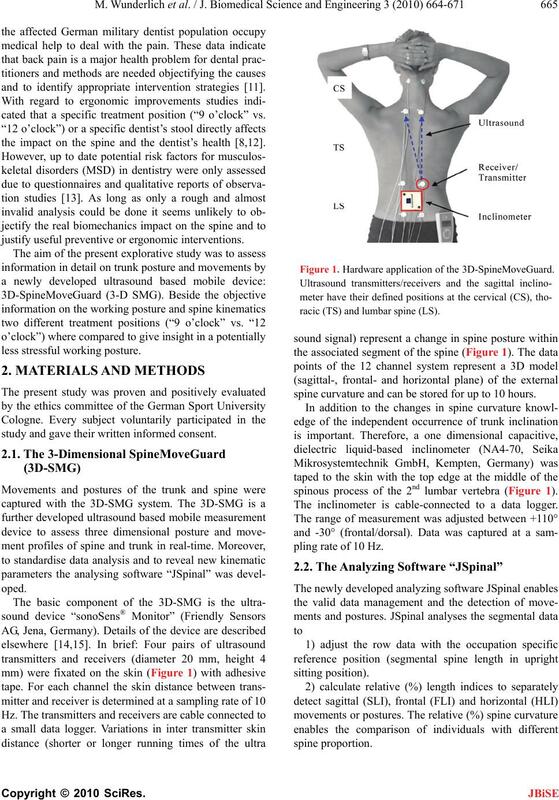 Hardware application of the 3D-SpineMoveGuard. racic (TS) and lumbar spine (LS). spine curvature and can be stored for up to 10 hours. spinous process of the 2nd lumbar vertebra (Figure 1). The inclinometer is cable-connected to a data logger. pling rate of 10 Hz. (e.g. flexion + torsion or torsion + lateral flexion etc.). median, 75th, and 95th) distributions. in a lateral left position and turned to the right. relation to the values of CS. SLI and FLI indicate an almost upright sitting position. patient was in front of the abdomen of the dentist). rotated to the left during the whole working day. the spine and within the three body planes. (CS), thoracic (TS) and lumbar (LS) spine. treatment positions of the dentist (9 vs. 12 o’clock). and lumbar (LS) spine as well as trunk inclination (TI). tures due to an altered treatment position of the dentist. tive isometric load to the spine [21,22]. exposure relevant differences could be estimated. training during and off work. dontology of the German Armed Forces Central Hospital Koblenz. Schneider, S., Schmitt, H., Zoller, S. and Schiltenwolf, M.
Occupational and Environmental Health, 78(4), 253-269. 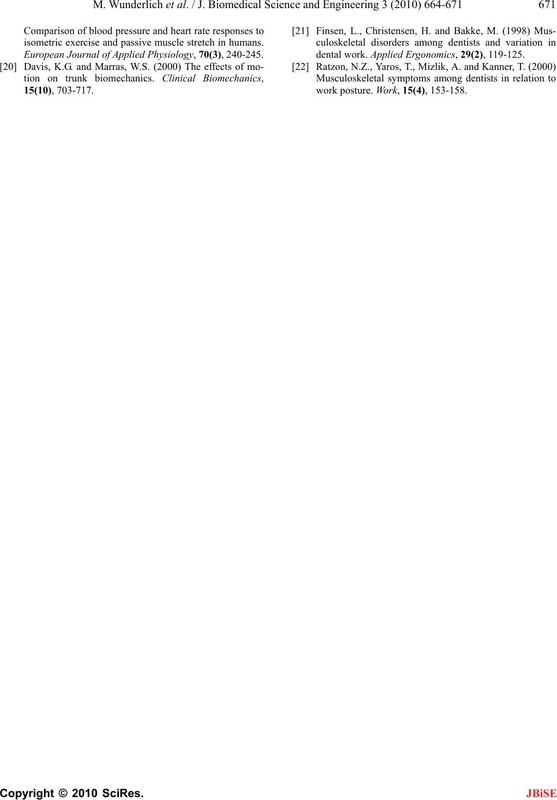 Opinion on Pharmacotherapy, 10(16), 2581-2592. Harkness, E.F., Macfarlane, G.J., Nahit, E.S., Silman, A.J. 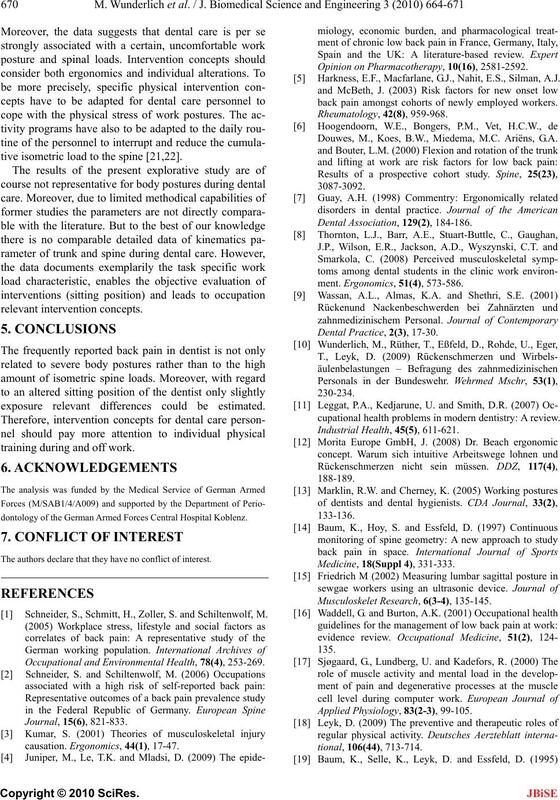 back pain amongst cohorts of newly employed workers. Douwes, M., Koes, B.W., Miedema, M.C. Ariëns, G.A. 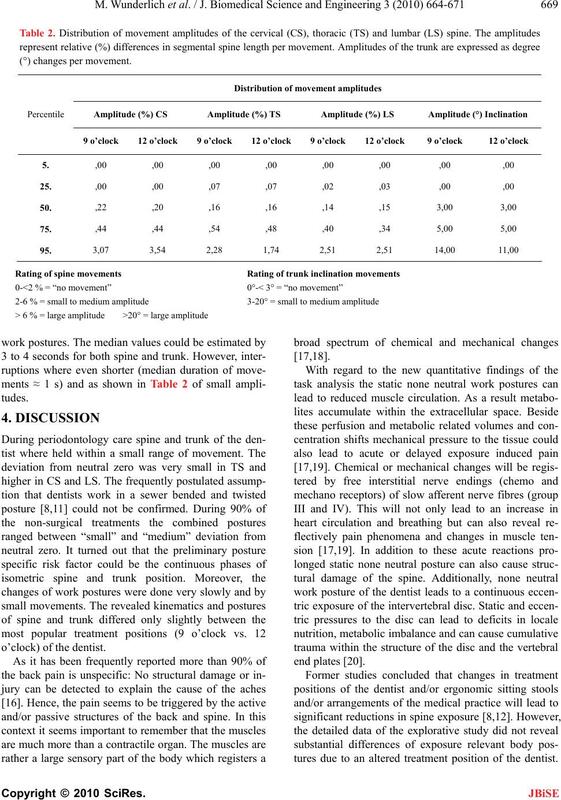 cupational health problems in modern dentistry: A review. 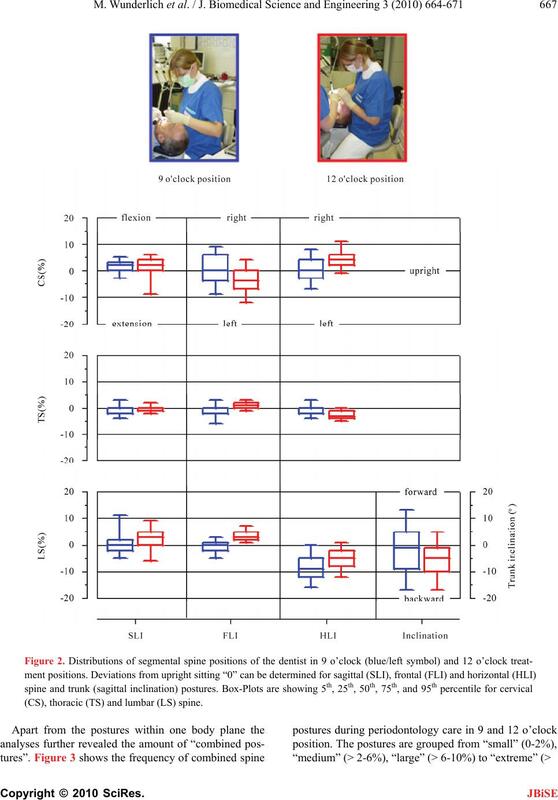 isometric exercise and passive muscle stretch in humans. 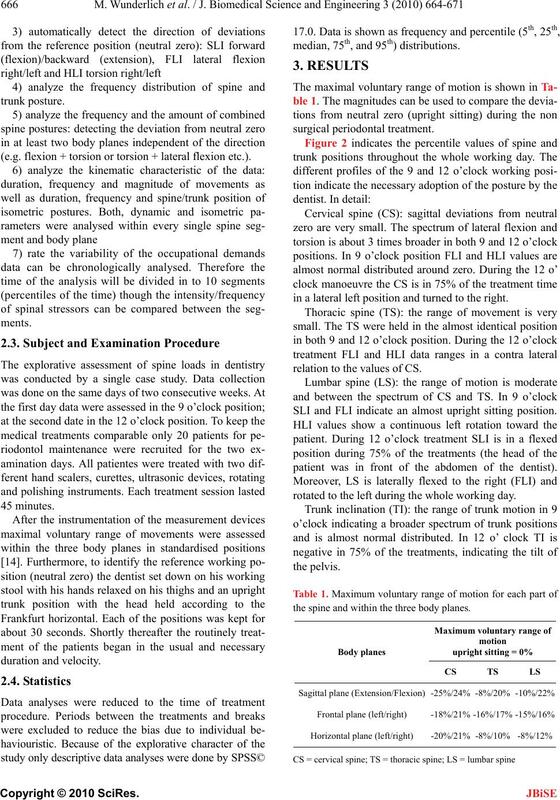 European Journal of Applied Physiology, 70(3), 240-245.
dental work. Applied Ergonomics, 29(2), 119-125.
work posture. Work, 15(4), 153-158.